Fig. 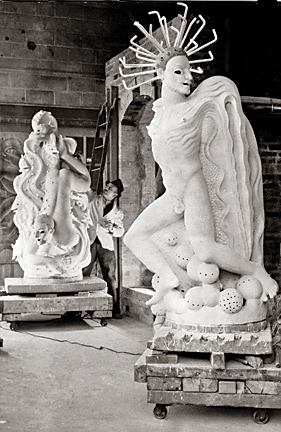 1: Waylande Gregory in his studio with his figures for the 1939 World’s Fair: “Air” in front of “Water”; Gregory is in the background, ca. 1938. Courtesy Gregory Archives, estate of Yolande Gregory. At the same time that Waylande Gregory (1905–1971), one of America’s most important ceramists of the 1930s, was creating his monumental ceramic sculptures (Fig. 1)—some weighing over one ton—he was also producing some of the finest American porcelains of their era. 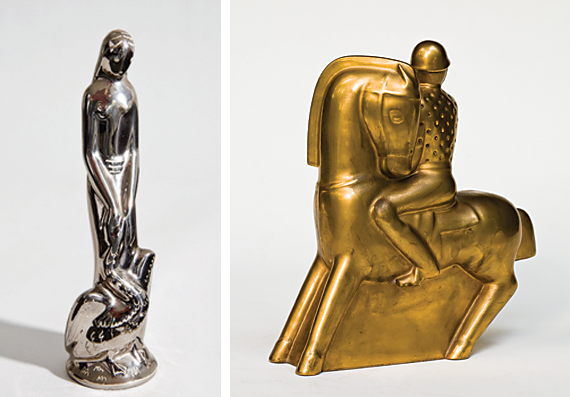 These smaller porcelain sculptures may have been Gregory’s greatest contribution to Art Deco. Born in Baxter Springs, Kansas, in 1905, as a child, Gregory displayed talent both in art and music. When he was ten years old, the young Gregory was awarded first place for a figurine, “Mother of Dreams,” in a novelty contest at the county fair. At age nineteen, Gregory moved to Chicago where he was invited by the sculptor and educator Lorado Taft (1860–1936) to live and work with him at his famed Midway Studios. It was there that Taft and his students (who included such leading sculptors as Bessie Potter Vonnoh and Janet Scudder) worked in bronze and stone. Gregory was one of Taft’s later students and by the time of his arrival, Taft’s Beaux Arts-style sculpture was no longer representing the current trends; Gregory may have learned the mechanics of sculpture from Taft, but he was looking to New York and Paris for inspiration. Fig. 2: Waylande Gregory (1905–1971), Flying Fish candle sticks, for Cowan Pottery, 1929. Translucent porcelain; 7½ x 5 x 3 inches. Private collection. Ceramics became Gregory’s primary medium when, in 1928, he became the chief designer and sculptor at the Cowan Pottery in Cleveland, Ohio, which was perhaps the last important American art pottery of the period. Gregory created some of the pottery’s finest works, including three limited edition ceramic sculptures relating to dance: Salome, The Nautch Dancer, and The Burlesque Dancer. The last two works were based on Gilda Grey, a well-known performer at the Ziegfield Follies, who allowed Gregory to make drawing studies of her from the theatre wings while she was dancing. At Cowan, Gregory had a full staff to assist him with all phases of production, from modeling to glazing and, finally, to firing. Gregory was creating molds; and, the clay body was porcelaneous, but not porcelain. However, a very rare pair of translucent porcelain flying fish candlesticks, which Gregory designed for Cowan Pottery (Fig. 2), were part of the artist’s estate. 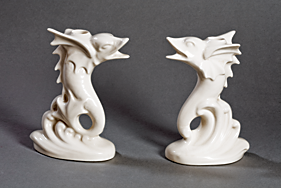 Cowan produced these in earthenware, but it may have been Gregory’s original desire for Cowan to make them in porcelain. These were probably his prototype for production. Unfortunately, the Cowan Pottery was one of several commercial pottery companies that fell victim to the Great Depression. Fig. 3: Waylande Gregory (1905–1971), Cranbrook Deer, ca. 1932. Glazed porcelain with polychrome glazes; 5 x 6 x 3 inches. Private collection. 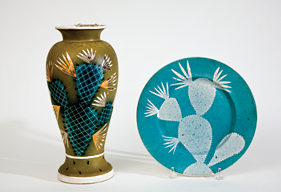 The artist’s career in the 1930’s mirrored the changing focus of American ceramics, from art pottery to studio pottery. Colleges and universities with emerging ceramics programs became instrumental in creating a new role for ceramists. In 1932, Gregory became a teacher of ceramics at Cranbrook Academy in Bloomfield Hills, Michigan, then rapidly becoming the leading place to study design in America. Other members of the faculty included the architect Eliel Saarinen and sculptor Carl Milles. Although Gregory was only there for one and a half years, it was a very productive period for him and where he produced many of his finest works. At Cranbrook, where he established the ceramics program, Gregory insisted on having two kilns: a muffle kiln, which allowed the artist to fire pieces up to thirty inches high—much higher than at Cowan—and another kiln for smaller pieces. Although Gregory and his new wife, Yolande, were provided with lodgings, all other income had to come from the sale of artworks and tuition from students, whom he, himself, had to solicit. At Cowan, Gregory had assistants, but at Cranbrook he had to handle all phases of production himself. At Cowan, Gregory’s designs had been mass produced for the general public. Now, as a studio potter, Gregory was no longer confined by middle-class taste and could appeal to a more educated, affluent audience. H. 11, W. 7, D. 6 in. Unlike his larger sculptures, which were handcrafted, his porcelains were molded (typical of the medium). Gregory’s porcelain deer (Fig. 3) relates to his earlier Art Deco style deer sculptures produced at Cowan. In fact, the mold for this work may have originally been made for Cowan as Gregory sometimes reused molds. However, the Cowan deer are always monochromatic while this colorful, ochre deer has many spots and splotches. In 1933, Gregory and his wife settled in Metuchen, New Jersey, and, in 1938, he began construction on a new house in Warren, New Jersey, which Gregory designed himself. He had become acquainted with Frank Lloyd Wright when he was in Chicago and Gregory’s architectural designs call to mind Wright’s Los Angeles homes. H. 7, W. 2, D. 2 in. Fig. 6: Waylande Gregory (1905–1971), Polo Player, ca. 1935–1940. Porcelain with luster glaze; H. 10, W. 9, D. 3 in. Collection of Paul Gratz. Fig. 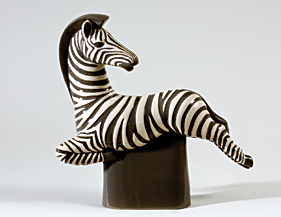 7: Waylande Gregory (1905–1971), “Zebra,” ca. 1935–1940. Glazed porcelain; 6 x 4 x 2 inches. Collection of Carlos Luciano. According to ceramics historian Ross Anderson, it was because Gregory realized he couldn’t support himself on his earnings from his large-scale ceramic sculpture alone that, in the mid 1930s, he began “to produce groups of small porcelain figurines, plates candlesticks and other decorative ware.”1 One of Gregory’s finest porcelain sculptures is Cretan Girl (Fig. 4), which is a translucent head of a young woman. 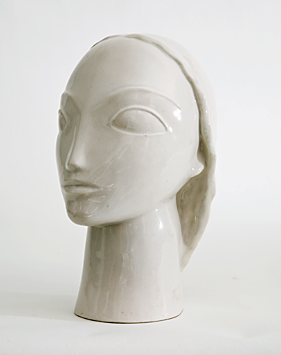 This reductive sculpture owes an obvious debt to Constantin Brancusi and calls to mind the Bronze Age white marble female heads from the Greek Cyclades. He originally intended this work as a limited edition, as it is marked “1 [from an edition] of seven.” Apparently, the concept of limited editions did not work as Gregory soon abandoned it. Another reductive porcelain female figure with a Grecian theme is his Leda and the Swan (Fig. 5), based on the myth of Zeus transforming himself into a swan in order to seduce Leda. Although he made several of these, this example is the only one known to have his platinum glaze, which gives this work a feeling of chrome and of machine-age modernity. Gregory’s most popular porcelain figure was his Polo Player (Fig. 6), for which he created castings with many different finishes and techniques. This ultra Art Deco theme was inspired by the polo games at Schley field in nearby Far Hills, New Jersey. Gregory even created matching dinnerware to go along with the polo figures. In 1936, House Beautiful magazine gave a whole page illustration to a grey and white set that included two porcelain figures of mounted polo players, surrounded by matching dinner, salad, and butter plates. The butter plates were also decorated with mounted polo players, while the salad plates were decorated with emblems of the sport, such as flags and mallets.2 Zebras were another popular Art Deco theme in Gregory’s porcelains (Fig. 7). They were sold singularly or in matching pairs over a fifteen year period. 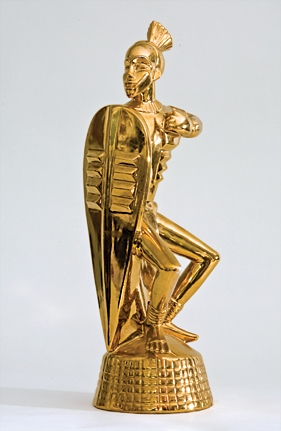 During the 1930s, Gregory was a frequent exhibitor at the Ceramic Nationals, an annual exhibition sponsored by the Everson Museum of Art in Syracuse, New York, which traveled to museums around the country and even to Europe. Usually Gregory featured his larger ceramic sculptures in these exhibitions, but at the 1936 Ceramic Nationals he showed his porcelain Zebra and Polo Player. Toucan 12 x 11 x 4 in. ; Rooster 15 x 14 x6 in. and luster glazes, 13 x 19 in. In the early 1940s, Gregory began to focus more on production ceramics and, especially, more on his porcelains. Around 1943, he hired Dolores Vigletti, a sixteen-year-old girl, to assist him in the decoration of production porcelains; Vigletti continued to work for Gregory for about twenty years. Rather than museum and gallery exhibitions, he now had seemingly endless showings of his work in high-end hotels, jewelry stores, and department stores all over the country. He would rent a suite in such New York City hotels as the Waldorf Astoria and the Plaza Hotel, where his work would be shown to invited representatives of leading retail establishments. These retail stores would offer exhibits of his work. Gregory would appear at these shows all over the country to greet customers and make sales. In New York City he showed at Mary Ryan, Tiffany and Company, Hammacher Schlemmer, Bonwitt Teller, Saks Fifth Avenue, Altman’s, and more. Upscale stores throughout the country where he showed his work included W & J Sloane’s and Robinson’s in Beverly Hills, Gump’s in San Francisco, Marshall Field’s in Chicago, and Nieman Marcus in Dallas. Fig. 10: Waylande Gregory (1905–197), Cactus vase, ca. 1945. Porcelain with luster and polychrome glazes. Vase H. 14, D. 7 inches. Collection of Carlos Luciano. Cactus plate D. 10 inches. Private collection. It was a major accomplishment for a ceramist that almost all of the leading retail stores in America carried Gregory’s porcelains. In 1938, in an article for Interior Design and Decoration magazine, Gregory explained his approach: “In designing service plates, for example, the color and design should be planned so that they will be part of only the particular household where they will go [referring to special or custom order plates]...Even when I design a so-called commercial line for a store, I keep in mind the personality of the store, the type of clientele, the kind of department for which it is destined.”3 Gregory was also among a growing number of ceramicists at the time who believed quality production porcelains should be hand painted and not machine decorated. H. 17, W. 6, D. 5 in. Perhaps the most interesting of Gregory’s porcelain sculptures from this period was the Zulu Warrior (Fig. 11), from about 1946, its gold glaze calling to mind the Ashanti more than the Zulu, as the Ashanti were known to be interested in golden objects.5 To achieve the glossy golden glaze, Gregory fired the gold luster glaze on this piece to 1500 degrees. (Luster is a metallic film on glazed ceramic, reduced from an oxide or sulfide by using heat to melt the metal on the porcelain body.) The “Zulu Warrior” was also intended as a centerpiece for Gregory’s African-style dinnerware, which was very popular in the fifties. 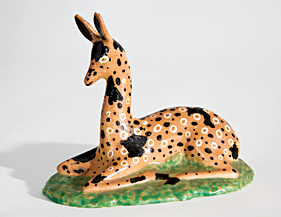 By the fifties, however, Gregory’s porcelain productions fell out of fashion and, by the sixties, he had turned to teaching, metal sculpture, and other interests. Yet, the perennial interest in Gregory’s porcelains proves they are some of the finest of the twentieth century. Waylande Gregory: Art Deco Ceramics and the Atomic Impulse is on view through September 29, 2013, at the University of Richmond Museums, Lora Robins Gallery of Design from Nature, 28 Westhampton Way, University of Richmond, Virginia. For information call 804.289.8276 or visit www.richmond.edu. Organized by the University of Richmond Museums and curated by the author, a monograph on Gregory published by the University of Richmond Museums accompanies the exhibition. The exhibition will travel to Cranbroock Art Museum at Cranbrook Academy of Art, Bloomfield Hills, Michigan, November 16, 2013 through March 23, 2014; and the Canton Museum of Art, Canton, Ohio, May 1, 2014 through July 27, 2014. Tom Folk, former curator at the James Michener Museum, is known primarily for his exhibitions and publications on New Hope Pennsylvania Impressionists. He also specializes in American ceramics. Folk currently teaches in the appraisal program at New York University and is on the education committee of the Appraisers Association of America. 1.Ross Anderson and Barbara Perry, The Diversions of Keramos, American Clay Sculpture 1925-1950 (Syracuse New York: Everson Museum of Art, 1983), 16. 2.House Beautiful (January 1936), 36. 3.Waylande Gregory, “Sculpture for Design Expression.” Interior Design and Decoration (December1938): 92. 4.“Gregory’s Sculptured Ceramics in Hammacher Schlemmer Show,” New York Herald Tribune (October 15, 1947); in Gregory archives. 5.According to ceramics specialist Lorraine Hoogs, Gregory’s complex mold for his warrior was composed in seven parts. See Lorraine Hoogs in Anderson and Perry, The Diversions of Keramos, 21.